The Primitive Methodists built this chapel in 1859 to replace an earlier one built in 1828 (on land bought from the Pheasant Inn for 5 shillings), which was described as "a very poor one and dilapidated" by the late 1850s. In the 1851 Religious Census it was reported that there were 34 worshippers at their service in the afternoon and 40 in the evening, as well as 14 and 19 Sunday scholars in the morning and evening. The ceremony of laying the first brick of the new chapel took place on 12th October 1859. They also bought some extra land for a burial ground. The chapel opened on Sunday 29th January 1860. The chapel is still in use today (2017), with its own burial ground attached. 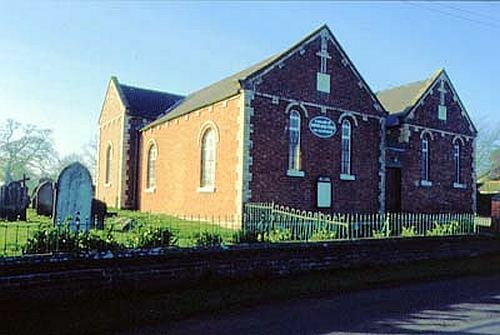 There is an adjoining Sunday School built in the same style, but not erected until 1913.